Considered to be one of the most important Bronze Age sites in Europe, excavations at Must Farm in Whittlesey have revealed more about what life was really like for our ancestors living 3,000 years ago than ever before. Following on from the myriad of news articles and BBC documentaries, this exhibition presents finds that never been on public display and highlights the stories that have captured our imaginations. Please note Peterborough Museum is open Tuesday - Sunday from 10am - 5pm (last entry 4pm) plus Mondays (inc bank holidays) during Peterborough school holidays. Join Home Front Legacy 1914-18 for their big recording month. Throughout August there’ll be encouraging people to research and record Home Front sites in their local area using our resources and recording app. You don’t need any prior experience to get involved and they’ll teach you all the skills you need. All you need to do is follow their weekly blogs, a new one will be posted every Monday from the 31st July. You will also need to register to access the Home Front Legacy Member Toolkit and recording app to start investigating your local area with the guidance of ther posts. For more information see their website: http://www.homefrontlegacy.org.uk/wp/blog/home-front-legacy-1914-18-big-recording-month/ Use the hashtag #WW1athome to keep up to date and to share the sites you discover and record. Toolkit 9: Local Authority cuts: Case studies - This document contains information on the types of cuts which many local authorities are making to their heritage services, and how to formulate arguments against them or propose alternate options. Toolkit 10: Getting involved with Neighbourhood Planning: Advice for the historic environment - This document seeks to fill a gap in available advice specifically about incorporating historic environment policies into neighbourhood plans and how individuals and groups with an interest in archaeology or heritage can get involved in the process. Twenty years ago this year a major archaeological dig took place on the area where the new houses are on Station Road. The finds were very significant: remains of a settlement, and a large Saxon burial site, with evidence of some 118 internments. This Saxon cemetery was an early example of early Christian burials, and a rare example of the changes to the beliefs of people moving from pagan to Christian. This event will include a review of the original findings by Quinton Carroll (Cambridgeshire Historic Environment Team) and an introduction to a major new project led by Dr Sarah Inskip (University of Cambridge). The project is funded by the Wellcome Trust and seeks to examine the health and life of these residents. This is an open meeting for everyone and is planned by GamArch, in partnership with the Gamlingay History Society. Jigsaw partner, The Great Fen, is appealing for votes after reaching the finals of the prestigious National Lottery Awards. The Great Fen is competing against six others in the Best Environment Project category. The project beat off stiff competition from over 1,300 organisations – a record number of entries - to reach the public voting stage in this year’s National Lottery Awards – the annual search for the UK’s favourite Lottery-funded projects. The Great Fen is one of the biggest habitat restoration projects in Europe with the aim of restoring and maintaining landscape scale wetland habitats in the the former Holmewood Estate in Cambridgeshire to past glory. National Lottery funding has enabled this group to create habitats for wildlife along with local community benefits, as you can see in their YouTube promotion film. Louise Rackham, The Great Fen Education and Community Manager, has said "It is working in partnerships on projects like the Spitfire memorial that has helped us reach the finals…we couldn’t do it without you people!" 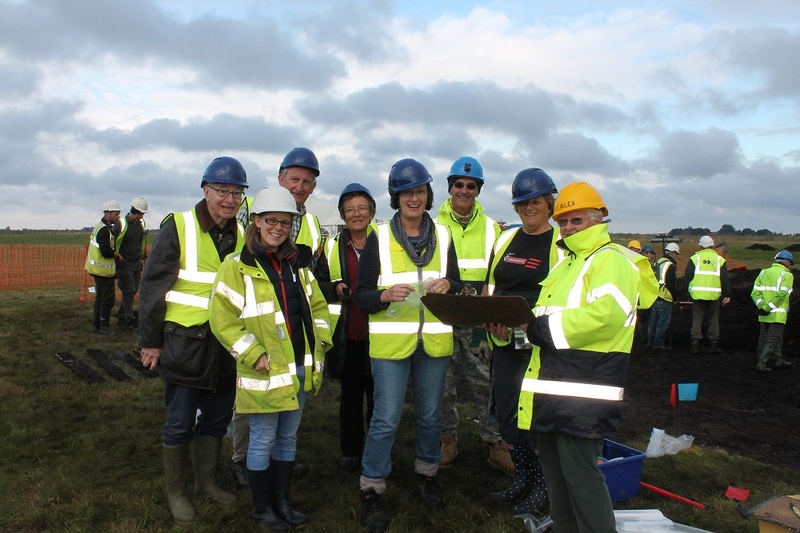 Jigsaw and Oxford Archaeology East worked with volunteers from the Great Fen Heritage Group and personnel from the Defence Archaeology Group in October 2015 to excavate the remains of a Spitfire X4593. You can read more about it here. To vote for The Great Fen, please go to http://www.lotterygoodcauses.org.uk/awards or telephone 0844 836 9689 and follow the campaign on Twitter: hashtag #NLAwards. Voting runs for four weeks from 9am on 29 June until midnight on 27 July. Don’t forget you can vote from your home e-mail too! Discover stories of ancient people, and how through DNA research we can reveal their hidden lives but also more about our shared story. There have been several archaeological excavations at the Wellcome Genome Campus undertaken by Oxford Archaeology East in the past twenty years, with many interesting finds. By combining archaeology with cutting-edge genomics research we are discovering who lived on this site thousands of years ago. Using archaeological finds, including human skeletal remains, along with film and hand-on activities, this exhibition will explore the hidden lives of our ancestors, and what analysing a genome can reveal about us all - past and present. The Cultural Zone exhibition space is open on the third Saturday of the month for drop-in visits, and at other times for special events. Group visits are also very welcome, by arrangement.